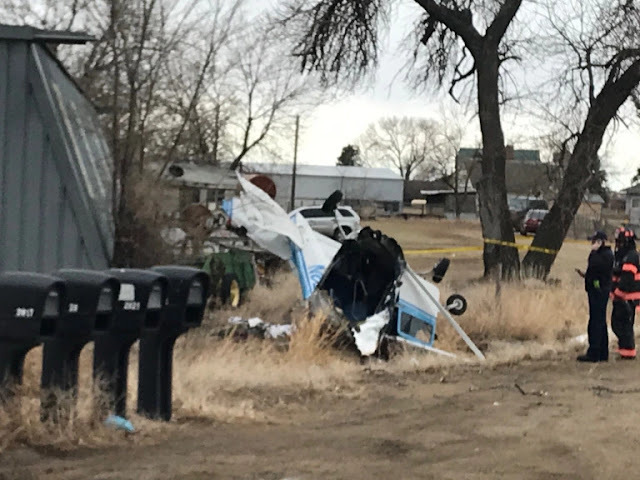 The three people aboard a single-engine plane survived when the aircraft crashed Saturday morning at a farm north of Loveland. 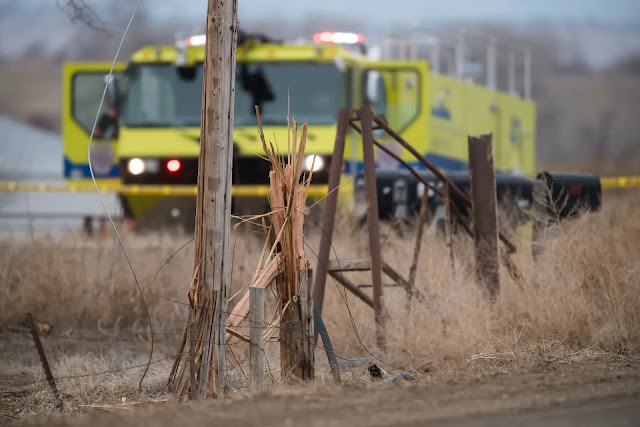 The plane hit power lines and possibly a tree as it came down about 10:40 a.m. next to a driveway of a dairy farm at the southwest corner of County Road 30 and County Road 9 (Boyd Lake Avenue), just northwest of the Northern Colorado Regional Airport. Fuel leaking from the plane started a fire on the ground that Loveland Fire Rescue Authority crews were able to extinguish, according to fire battalion chief Tim Smith. 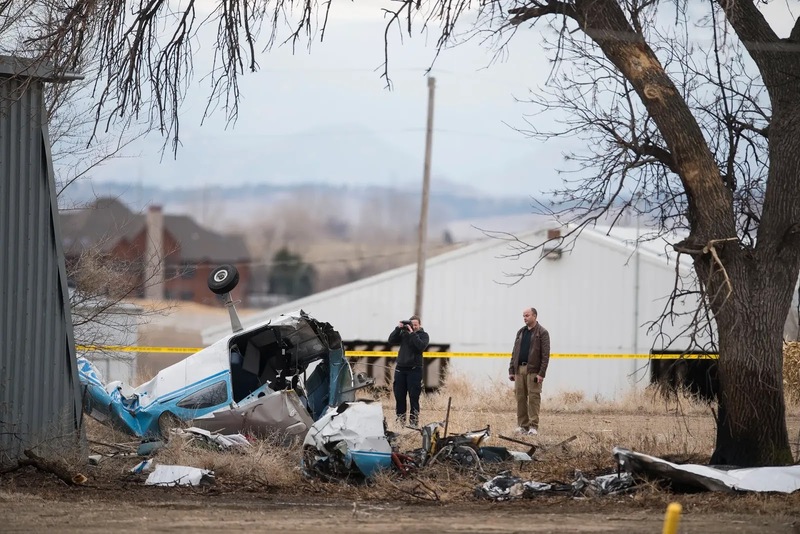 The three occupants were out of the plane, which was lying in pieces under and next to the tree, by the time emergency crews arrived, Smith said. 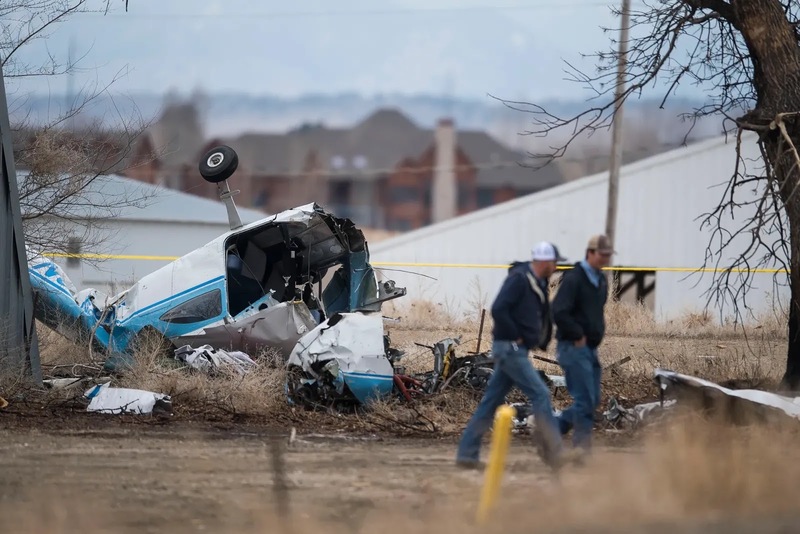 "Two of the passengers were able to get out of the aircraft without assistance, and one got out of the aircraft with the assistance of a passerby," said Larimer County Sheriff's Office Lt. Jeff Vanhook. He said all three were taken to Medical Center of the Rockies in Loveland with injuries that appeared to be non-life-threatening. 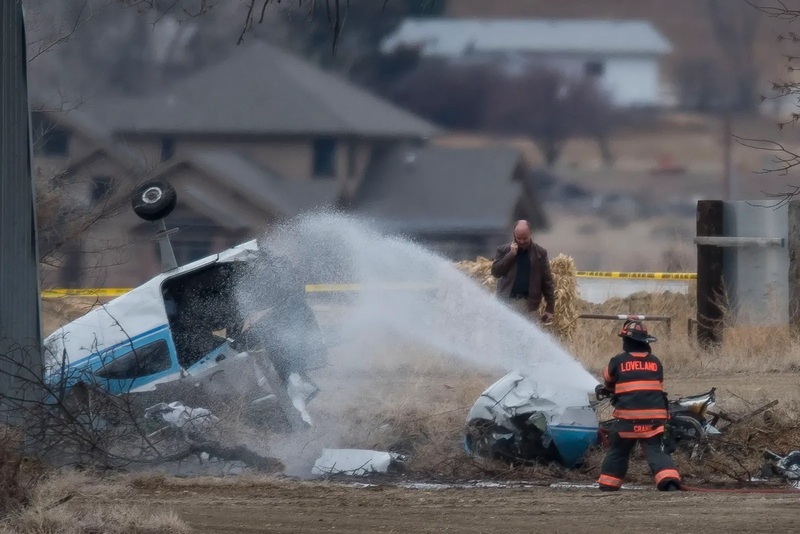 The names of the pilot and passengers have not been released. 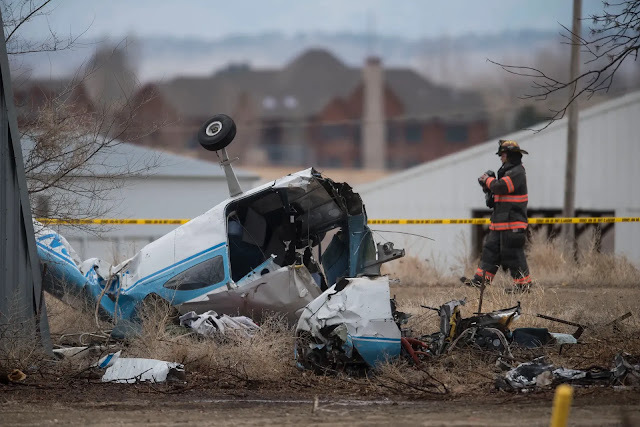 "Looking at the damage to the plane, we feel very fortunate that -— we're hopeful that they will have a full recovery," Vanhook said. 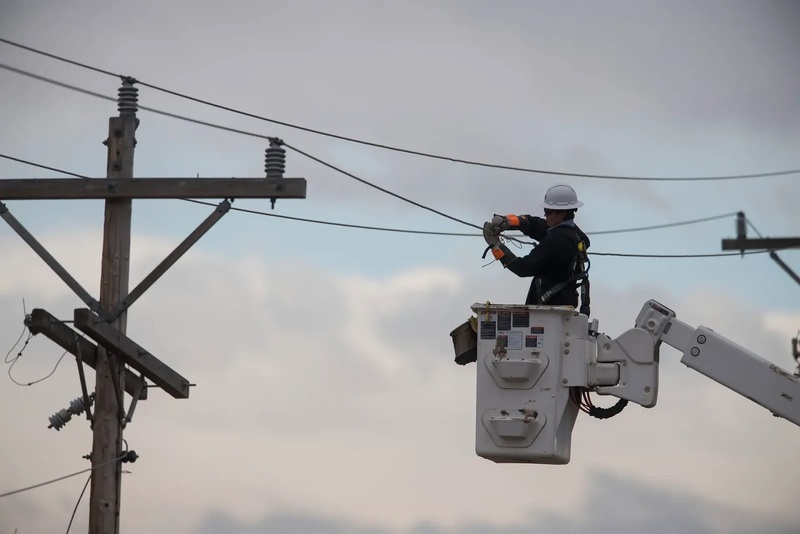 "We believe the aircraft clipped a power line and one of the support lines," he said. VanHook didn't know if the plane also hit the large tree under which some of the wreckage was lying, but the tree appeared to have torn bark and broken limbs on that side. Next to the tree, just off County Road 30, a power pole had been sheared off about 6 feet off the ground. The top part of the pole was standing upright next to the stump, supported by the lines that remained intact. The plane's wing lay under the tree, part of its nose section next to it, with the rest of the fuselage, upside-down, a little to the south. 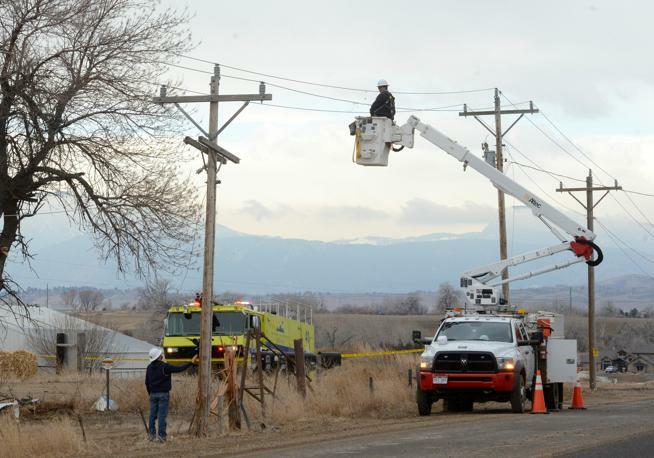 After the ambulances left with the plane's occupants, a Poudre Valley REA crew worked on the power lines. Smith said one of the concerns was the fire danger from the fuel that remained in the plane. He said the tanks were full when the plane crashed, and about half of the fuel remained onboard. Sheriff's Office Capt. Mike Loberg said witnesses reported that the plane "looked like it was standing still. It was moving very slowly" before it hit. 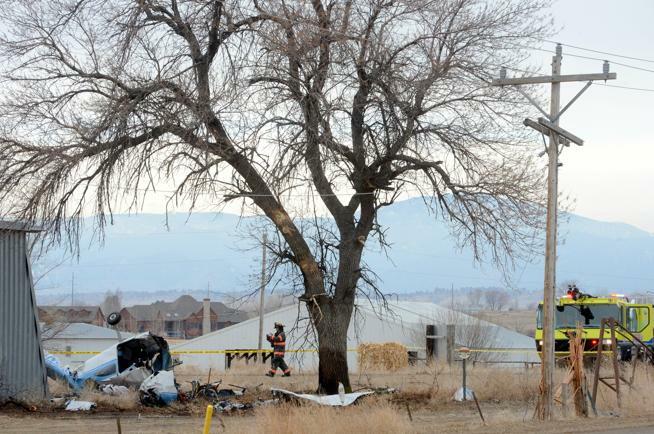 The plane was traveling to the southwest when it crashed, Vanhook said. Jason Licon, director of the Northern Colorado Regional Airport, said he doesn't believe that the plane came from the airport, but wasn't sure. He said the crash didn't affect operations at the airport. Fort Collins resident Glenn Dawson, a private pilot, drove to the site after the crash to briefly watch the crews at work. He said he was in the air at the same time as the plane that crashed, and he landed right before the accident. He didn't know about the crash until he went inside the airport, he said. 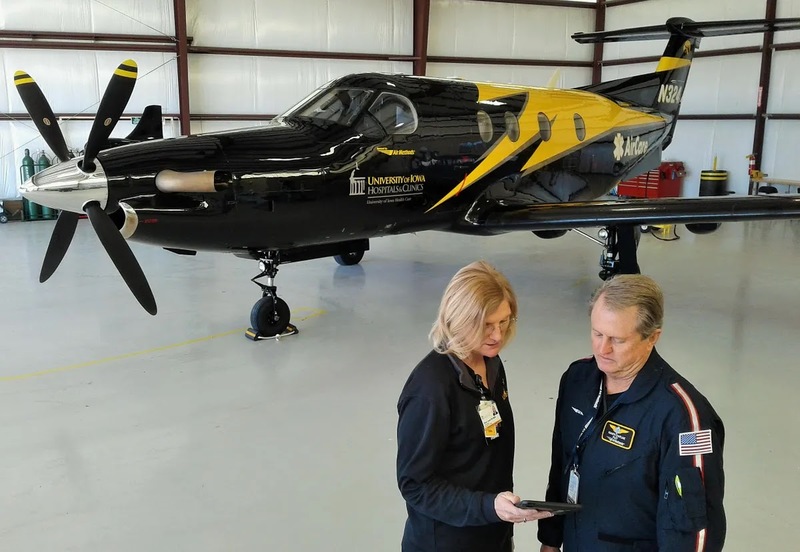 Dawson said he couldn't say much about the crash until he is interviewed by the Federal Aviation Administration, but he said he experienced downdrafts in the area when he was flying. He said the plane that crashed was a high-wing Cessna. 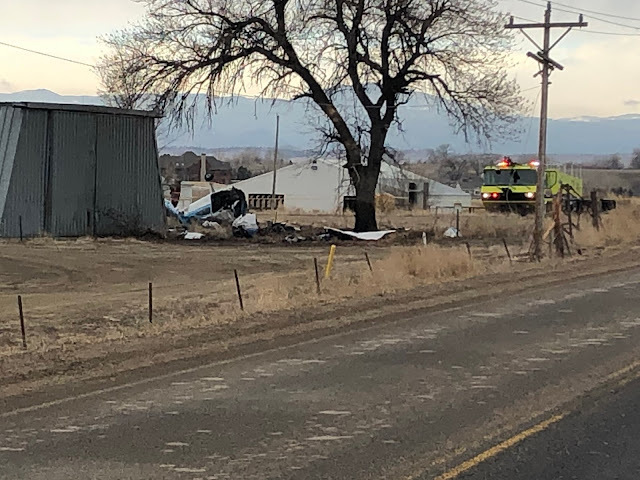 Vanhook said the Federal Aviation Administration and the National Transportation Safety Board would investigate the accident. Based on the damage in the pics it's a miracle no one was killed, especially with a post-crash fire. CAP or AirForce trainer? Flight aware shows this plane flying a very often but no pattern work. More like commuting. Maybe they’re renting out airplanes making a few bucks on the side. Since it’s taxpayer money, you can’t help but wonder what they are doing. If you ask, your being nosy.